Hoping everyone has been having a great start to the new year. 2017 is shaping up to be an exciting year for us here at Lone Mountain Cattle Company. 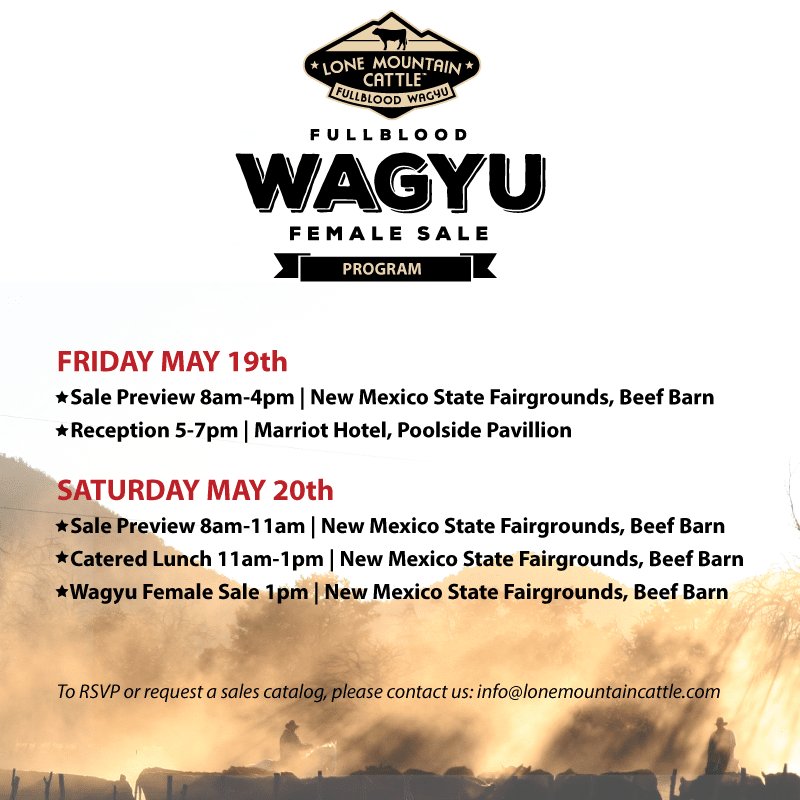 As some of you may have heard, we are busy getting ready for our 5th Fullblood Wagyu Production sale on Saturday, May 20th at the Beef Barn inside the New Mexico State Fairgrounds at 1pm. We are confident that this sale will be a great way to start your herd (if you’re new to the breed) or enhance your current herd. 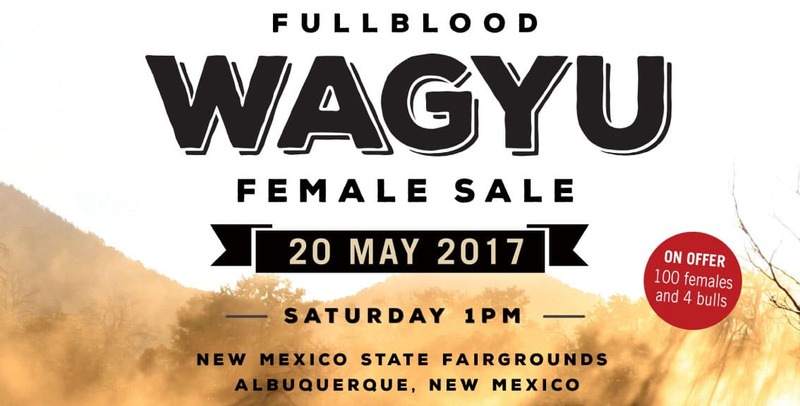 Highlights of the (primarily) Female Sale will include 4 SCD AA Fullblood Wagyu Bulls, including one that is rated AA 10 and 98 Fullblood Wagyu Females, including 3 that are rated AA10! We would love to invite you to attend this exciting and informative event. We will have plenty of events happening the days leading up to the event and we would love to have you in attendance. Lone Mountain will host a welcoming reception from 5-7pm MST on Friday evening, May 19th, at the Marriott Hotel in Albuquerque (Sale Headquarters). Wagyu Sliders will be served. 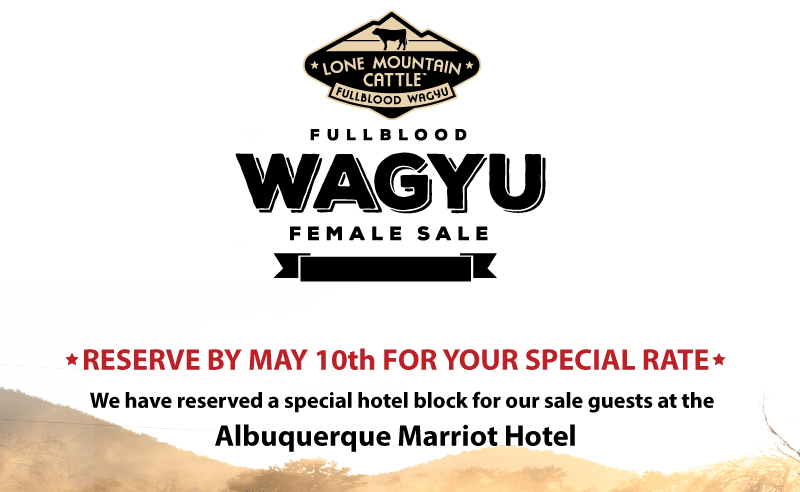 This is a great opportunity to network and get to meet your fellow Wagyu breeders. We will host a seminar on Friday afternoon at the Beef Barn. Michael Beattie and Bob Estrin will discuss the importance of EBVs/EPDs and the interaction with BREEDPLAN. We will emphasize the importance of the collection of all possible objective measurements and how you can use the data. Lone Mountain will also be hosting a lunch prior to the sale – The lunch will begin at 11am. We will be serving Lone Mountain Wagyu Brisket tacos and mouth-watering Lone Mountain FB Wagyu Sausages. The Sale will begin promptly at 1PM – Auctioneer, Butch Booker will be on hand. Sale management by Jim Danekas Associates (JDA). If you are planning on attending, we have fantastic rates with the Marriot Hotel (also our Sale Headquarters) in Albuquerque. Our special rate availability ends May 10th. Unable to make the sale in person? We will be streaming the sale on LiveAuctions.tv. Register and view our Sale to participate. If you would like to RSVP, have any questions or would like to receive a copy of our Cattle Sale catalog, please send us an email at info@lonemountaincattle.com with your name and address. © 2016 Lone Mountain Cattle Company. All Rights Reserved.